3M Coban 2 Layer Lite Compression System is a latex-free low profile, comfortable compression that that goes on in two easy steps for the management of leg ulcers and other clinical conditions where compression is appropriate. It is comprised of a comfort layer and a compression layer. The Compression System provides sustained therapeutic compression for up to 7 days. It is clinically proven to significantly reduce slippage and improve patient’s daily living activities. The thin, lightweight, breathable sleeve allows patients to wear their own shows, so they can return to regular daily activities. 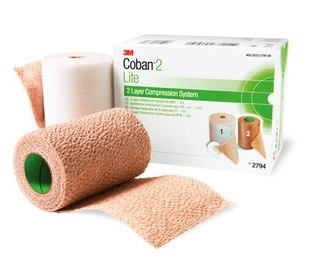 Coban 2 Layer Lite Compression System (Cat #2794) may be used for patients with ABPI greater than or equal to 0.5.